OK, so in my last post I was already to hang up my blogging hat, but maybe not yet… Here’s a post of a recipe I made up myself! Not the most technically difficult but thought the taste was good I’d make again. Grate the beetroot (best done wearing rubber gloves!) and mix with the cream cheese and nigella seeds. Unroll your puff pastry onto a baking sheet and spread the cream cheese/beetroot mixture over, leaving a gap round the edge. Slice the goat’s cheese into rounds (I sliced about 9 discs) and arrange on the beetroot mix. Worked really well and good the next day as leftovers. 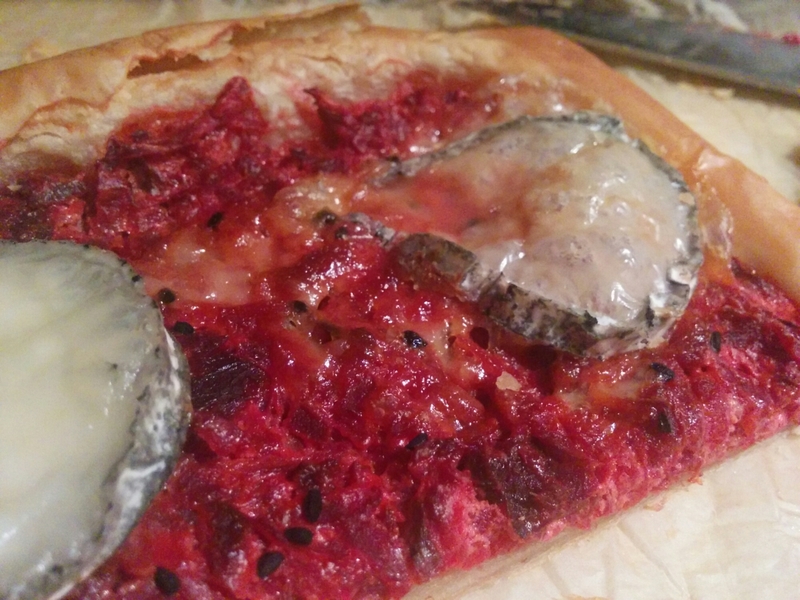 This entry was posted in Main dish, Vegetarian and tagged beetroot, cheese, pastry. Bookmark the permalink.